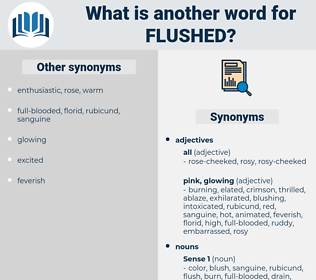 What is another word for flushed? 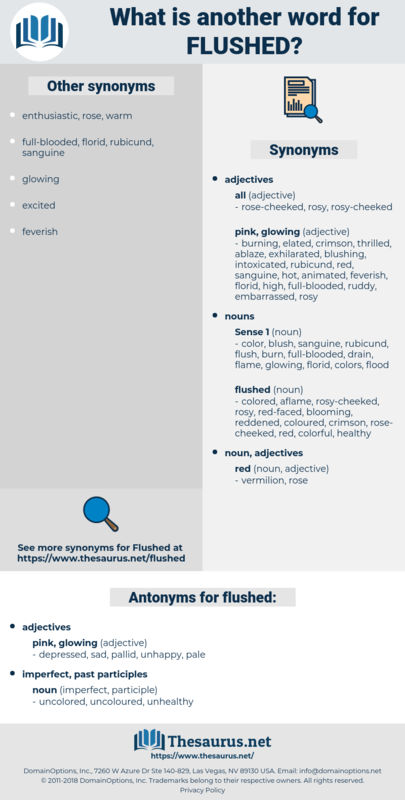 shut, discarded, stuffed, Shoved, disregarded, chucked, Slammed, locked, dumped, laid, lay, Tossed, turned, Threw, 've, Looked, put, dropped, cast, drove, kicked, ai, shed, Got. washed, Pushed, submerged, flooded, smashed, overwhelmed, discarded, evacuated, Hurled, destaged, Spilled, offloaded, disposed, discharged, Rinsed, drained, fed, abandoned, dumped, download, downloaded, hunted, stranded, released, unloaded, laid, inundated, Tossed, built, Betrayed, thrown, paved, Looked, wired, put, dropped, cast, kicked, shed. depressed, sad, pallid, unhappy, pale. The priest flushed like a boy. Alan's face flushed like her own.